There's something quite odd going on in our house. A couple of weeks ago Mrs. Dufus and I were parked in front of the television. We'd just settled in for the next instalment of The Amazing Race, at 8pm, when the doorbell rang. My wife got up to see who was at the door, she being closer. When she opened the door no one was there. Odd. No. One. There. Was someone playing a trick on us? A little past Halloween, you know. Hmm. Several nights later the wife and I had assumed our positions...in front of the television. We'd just started watching the 10pm news when ding dong. "Who the hell's at the door at this time of night?" I barked and this time I went to the door. There wasn't a soul in sight. Hmm. The odd thing about this is we have security lights outside on motion detectors. Each time all was dark. Hmm. 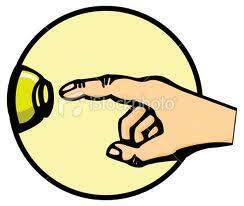 The other morning at 5:30am I was awakened by...you got it...the doorbell. Now our doorbell doesn't just go ding dong. Oh, no, we had to set it to the tune Big Ben makes on the hour. You know: ding ding ding dong, ding ding ding dong. This can be pretty annoying when there actually are people at the door. More so at 5:30 in the morning when no one's there. So we would seem to have some phantom modern-day Hunchback of Notre Dame. Or maybe there's some kind of short in the system. But then it's wireless and runs on batteries. Or maybe the racoons are paying us back for tying down the lid on the recycling bin. But I guess you've gotta look on the bright side in all of this. At least there wasn't a flaming bag of crap on the doorstep. "Who's that knocking at my door?" I think you've got a gremlin. You gave it water after midnight, didn't you? It must have rung 4 or 5 times Saturday night. Finally when it went off at 2:30am I got up and ripped out the batteries. Quiet around here now. "De de dee de". That's spooky music in case you're wondering. Maybe the batteries were low. My smoke alarms beep when the battery gets low. Or maybe it was a ghost. And, before you ask, I haven't read the book - yet. I was going to suggest it's your batteries too. Then again, it could be the ghost of a dead Avon lady. Leeuna: Yeah, I'm going to buy replacement batteries and see what happens. 00dozo: It tolls for me! A dead Avon lady? Love it. You don't need a damn doorbell. I don't have one. The dogs tell me if somebody is out there. And I don't usually answer it unless I know somebody is coming. If I don't know they are coming, why would I open the door to them. If I invited them, fine. I'm waiting for them. I think you should just forget about the doorbell altogether because that would annoy the hell out of me. Linda: I like your approach. It wouldn't work for me though. 1) We have cats, and 2) I don't want to miss my pizza delivery. I would look into the paranormal, but either way you should web cam your doorway and then share with us your findings. Bluezy: Hey, now there's a thought! I like it. the web cam sounds like a plan and if you film a ghost....theres money in that...you could afford a butler and do away with the doorbell ! IWBY: Welcome, first-time commenter! Wow, you've really thought this through. I'll start with new batteries and go from there... Might be a tad cheaper. IWBY: Sadly. no. But it'll give me something to do. Do You Want A Louisville Slugger With That?